Bart de Zwart, Joanne Hamilton-Vale and 14 other bold stand up paddlers have survived extreme heat and a serious lack of sleep to conquer the MR340, a 547km (340 miles) race along the Missouri River. With just 16 days rest following his epic conquest of the Yukon River, Bart continued his series of ultra long distance events – aka the world’s longest SUP races – by winning the 11th Annual MR340, a race he described as the toughest he’s ever done. Bart won in 51 hours 15 minutes, while Joanne was the fastest woman and third fastest overall in 61 hours 26 minutes. Although the MR340 is shorter than the Yukon River Quest (547km vs 715km), the journey took almost just as long, and conditions were noticeably tougher as the mercury pushed close to 40°C (104°F). Bart reached the finish line at St. Charles, just outside St. Louis, just after 10am on Thursday (the race began in Kansas City at 7am Tuesday). Bart slept for less than 2 hours the entire race — unlike most ultra long distance races, there are no mandatory rest points in the MR340, with paddlers free to choose how much or how little rest they take, and where they take it (many slept in sleeping bags on the muddy banks of the river). 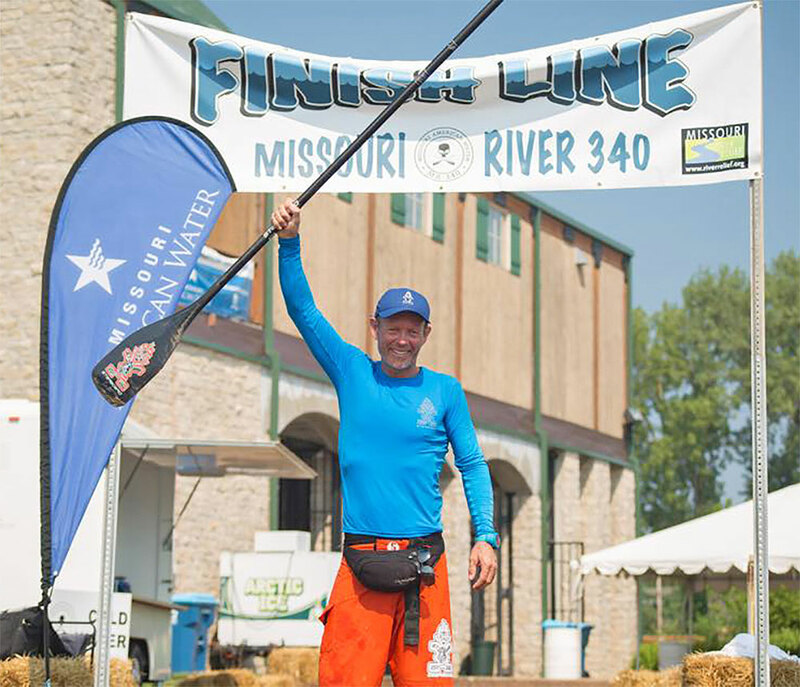 With his 51 hour performance, Bart sets a new race record, though even more remarkably he was the 14th paddler over the line in a field of almost 400 teams. 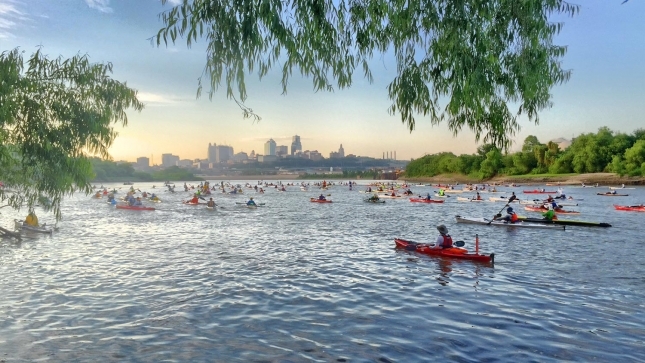 Considering most of those teams were canoes and kayaks (which are generally faster than a SUP), and that many of them were two-, four-, and eight-person craft, Bart’s achievement becomes even more incredible. The veteran endurance paddler said this was probably the toughest race he’s ever done, and that the final stretch required a serious dose of mental strength. But the one part of this epic saga that really stands out for me is what Bart did when he got to the finish line. Instead of just going straight to bed and catching up on about 16 hours of missed sleep, he stayed awake for another 12 hours to make sure he was there to cheer loudly when Jo crossed the line. Joanne was the fastest woman and third-fastest SUP (i.e. she beat most of the men), which is impressive in its own right, but becomes even more amazing considering she picked up a serious parasite during the Yukon River Quest that she spent most of the past two weeks recovering from. 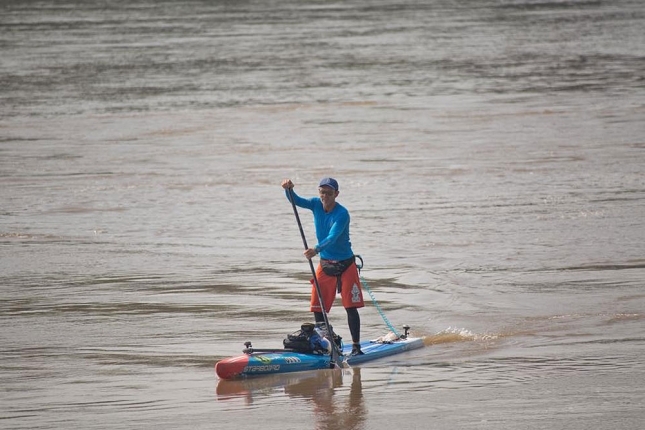 Jo was forced to retire on the Yukon, which was part of her motivation for coming to Missouri to complete this race. Jo told me her first 24 hours were strong but the next 36 were a real test, and that just like Bart she felt this was the toughest SUP race of her life. Crossing the line in second place was Mitch Anderson, who was only an hour behind Bart after more than two days of paddling. Mitch was on an unlimited board but his effort was still extremely impressive. He paddled even further than Bart before taking his first sleep break, which meant he briefly took the lead and made it a genuine contest for the line honours. The final SUP competitor to cross the line was Jerry Joe Alfafara, who spent three and a half days on the river but safely finished inside the 88 hour cut-off time. Of the 487 teams that were registered to race, 114 pulled out before the start, with the threat of extreme heat being the main reason. Another 112 teams withdrew during the race, which means only 261, or just 54% of the field, completed the epic voyage. Here are the times for all of the stand up paddlers, and below that you can read some very interesting insights from Joanne and Bart. What an absolutely extraordinary race this is, and everyone that finishes deserves a huge round of applause. Just last week I labeled the Yukon River Quest the “Toughest SUP Race in the World” but this one is surely even tougher. So… who’s keen to to do the MR340 race in 2017..? Patrick Albert and David Harper withdrew from the race after 24 and 29 hours respectively. 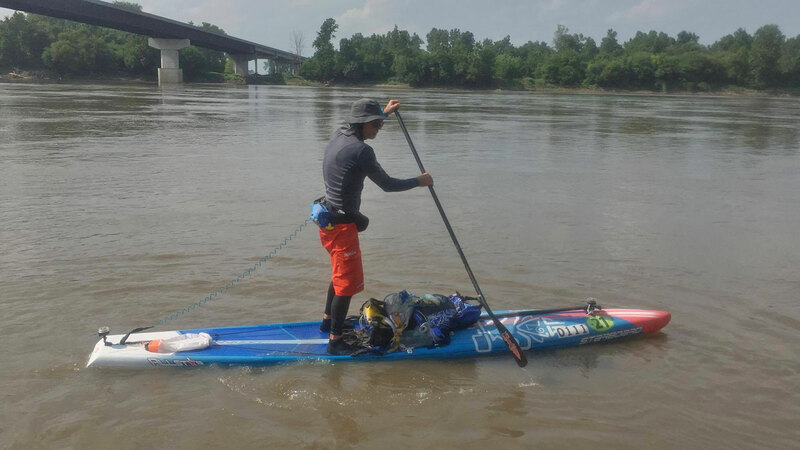 Special mention goes to Shane Perrin, Dale Sanders and Jerico Lefort, who were paddling a three-man unlimited SUP and finished in a time of 79 hours 23 minutes. Shane was the one who pioneered this race for stand up paddlers back in 2011 (an effort that’s featured in the ‘Stand Up Guy‘ documentary). Click here for the full results from all divisions (most of the times on that list seem to be one hour faster for some reason). “The MR340 is the toughest race I’ve ever done. 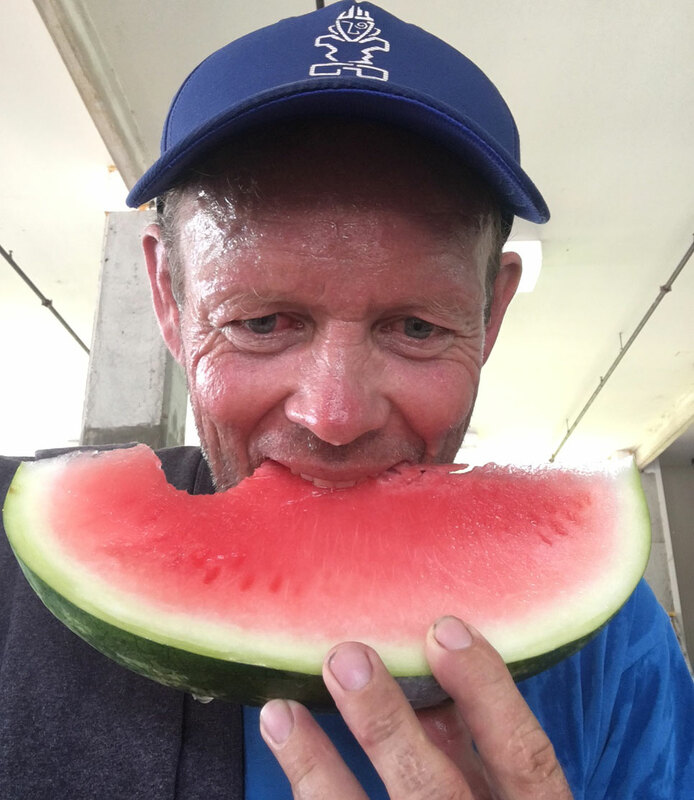 Paddling 547km (340 miles) when the temperature was reaching 40 degrees (104°F) during the day and never dropping below 23 (73°F) at night added a whole new dimension to the challenge. “This was a real mental challenge not only because of the distance and the heat, but also because the view was very much the same – muddy banks and trees – for most of the race. There was nothing to take your mind off the paddling. The heat really hit me because I have a condition that stops me from sweating and regulating my own body temperature — I was drenching myself in water every 30 minutes to stay cool. I probably got about four hours sleep in total, with one of those in thick mud on the river bank. Now that I’ve had time to sleep and recover I’m feeling good. Not much pain in my back and shoulders, so I came out the other side fairly well. 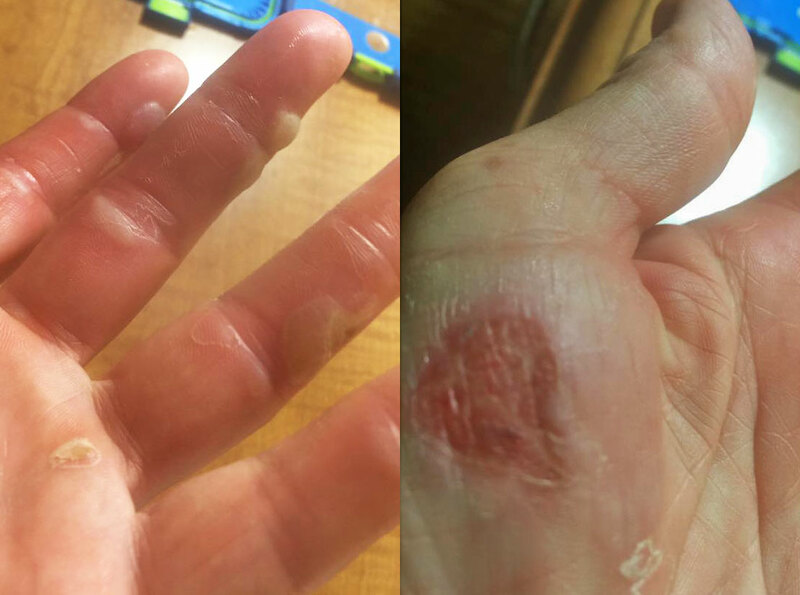 However my hands are extremely sore and my feet are swollen. Thankfully I have the perfect travel buddy in Bart de Zwart, who always keeps everyone’s spirits high. “This is one of the toughest races I have ever done. The heat, the distance and sleep deprivation make it so tough. People are still coming in to the finish line as I write this 24 hours after I finished, with some competitors likely to take three and a half days to complete the course. – How did you feel when you reached the finish line? “How did I feel? After about 40 hours of paddling, which was around midnight on my second night, with just 2 hours of sleep and knowing that you have to paddle for at least another 10 hours in scorching heat, with burning muscles, aches all over your back and numb toes… You feel pretty bad at that point. But this is where it becomes a test of mental strength. Although your body tells you to stop, there is a strong will to finish the race as well as you can. The feeling of satisfaction you know is waiting for you at the finish keeps you going, while the thought that you can finally relax and watch the race as an outsider as the other paddlers cross the line also motivated me. After I crossed the line I called my wife and ate a piece of watermelon that tasted better than anything I’ve ever had in my life. – How does it compare to other ultra races? – How did you manage the extreme heat? “Managing the heat and humidity on the water is actually easier than on the land. In the hottest hours, I drenched myself every 15 minutes with river water, which meant my clothing (race leggings, long sleeve short and a hat) was wet all day. That really cools you down a lot. The Missouri River is known as the “Muddy River” but you quickly stop caring about the colour of the water when you realise how much it can help you fight the heat. – How much difference does 2 hours sleep make? And how did you fight the urge not to sleep longer? “I know it’s not a lot but it really does make all the difference. When I started this race I went out with a quick pace. One of the racers had told me at the briefing the day before that he wanted to smash last year’s SUP race record (~60 hours), and nothing motivates me more than hearing something like that. So I thought OK I’ll go out strong pace but I won’t overdo it — I’ll race at a pace I know I can hold for a very long time. I was hoping this pace would be just a little too much for the other competitors, wearing them down and putting me in a position to get the victory and record. With this starting strategy, none of the other paddlers were able to follow me for the first few hours, so I was confident I could hold the lead, however there were of course many kayakers who are on faster craft and therefore gave me something to keep up with. After 16 hours, at around 11pm on the first day, I slept for around 20 minutes. I was very tired on this first night — I think all the travel in the days before the event plus a short night’s sleep on the eve of the race didn’t help. And a 20 minute sleep does do you a lot of good. The next morning at around 10am, when I arrived at the 5th of 10 check-points, I really needed some sleep. I felt I had a good lead, so I went on land and told my great support guy Mark Price, who was helping me all race by changing out my food and water at the check-points, that I wanted two hours rest. But after one and a half hours I woke up and felt ready to race again. To my big surprise, Mark told me that 45 minutes ago, another stand up paddler had passed me (Mitch Anderson). Until that point we didn’t know he had only been about one hour behind me the entire first half of the race. Mark didn’t know if he should wake me up to alert me, or let me continue sleeping. I actually would have wanted to be woken up, but this was my fault for not telling him beforehand. This is about 29 hours into the race now, and despite the lack of sleep I’m suddenly full of adrenaline to chase down the new race leader. I filled my water packs and sped off. Within the next hour I passed four other paddlers (kayaks and canoes). Every time I saw someone in the distance, I focused on them until I caught them. Suddenly it was really feeling like a race. I figured the lead paddler (Mitch) probably hadn’t stopped to sleep yet, so I would be in better physical condition, and I knew that my average speed would probably be slightly higher, so even if it took another 6 hours I was confident I would eventually chase him down. Mitch was also on an unlimited board which made my job even harder. After two more hours I eventually caught up. At first I didn’t even realise it was him, because he was sitting down and resting. When I passed him he was suffering, very tired and out of energy. I talked to him to see if he was OK, and he told me he couldn’t keep going and needed to stop and rest. So I kept going on my own, and for the final 24 hours of the race I didn’t have any real stops or any sleep at all. Just a few two-minute rest stops to change over my water packs. However even when I stopped paddling for just a couple of minutes, I would begin feeling very sleepy and started dozing off. Though somehow even just dozing off for a few seconds keeps the sleep deprivation away for a few more hours. Ultra long distance races are my specialty so I felt confident going through the second night, and I was feeling very awake and relatively fit in the early hours of the morning as the race clock ticked towards 48 hours. – How did the other stand up paddlers go? “Joanne had a really hard time but achieved an awesome result, beating most of the men (she was the 3rd SUP across the line). She was physically strong but struggled with what she was eating and drinking. Her time was very fast — around the same pace as the previous race record — so it was a very impressive performance from Jo. The second woman, Lauren Rodriguez, was trying to set a record and was only an hour behind Joanne most of the race, however she had a really hard time on the third day and ended up crossing 15 hours behind. Last year’s winner and course record holder, Blake Thornton, finished in 64 hours, with most of the stand up paddlers finishing somewhere in the 70s. Most of the SUP competitors are really experienced with a lot of miles under their belt, but a race like this brings you to a place you haven’t been before both physically and mentally. And of course it was an exceptionally hot year. The river was also moving slower than most years, which made it even harder. – What was the general impression from all the competitors? “When most competitors got off their craft at the finish line, many needed help to walk, with most saying they would never do it again (though many people changed their mind after 24 hours of rest). This is a major accomplishment for everyone and it feels really good when you have finished. This was considered one of the toughest ever years because the water flow was very slow, and also because it was one of the hottest races on record. – What have you learned from this race? “I learned a lot about managing nutrition and eating during a race. The most important thing with these races is to eat and drink all the time even if you don’t want to. You can burn up to 10,000 calories a day so you need your energy. The main thing is time management — if you plan your breaks and sleeps really well, and don’t linger too long after you wake up, you can significantly reduce your overall time. And also if you take a quick rest on the water, sitting down on your board for example, you are still moving slowly with the current, which is better than sitting down on land and going nowhere. I believe more and more people will start doing ultra long distance races such as the MR340 and Yukon River Quest on a stand up. I feel we are opening more and more peoples eyes that it’s possible to do these races on a SUP. However if you are new to stand up paddling and want to do “ultra” races, I recommend you start with ones that take less than 24 hours so you can learn how your body reacts and get general experience.